Admitted to practice before United States District Courts in Missouri (Eastern and Western Districts), Illinois (Northern, Central, and Southern Districts), Wisconsin (Western District), Kansas, Nebraska, Michigan (Western District), Indiana (Southern District) and before the United States Courts of Appeals for the Sixth, Seventh and Eighth Circuits. Andrew Martone is the President and CEO of the Firm concentrating in the practice of labor and employment law, with a background in industry and human resources. Andy routinely handles matters before the NLRB, EEOC, the Department of Labor, OSHA and numerous state agencies. He regularly represents clients in employment-related litigation in federal and state courts throughout the country (including cases based on race, gender, disability, religion, harassment, national origin, FMLA, veteran status, retaliatory discharge, the False Claims Act and public policy discharge cases). 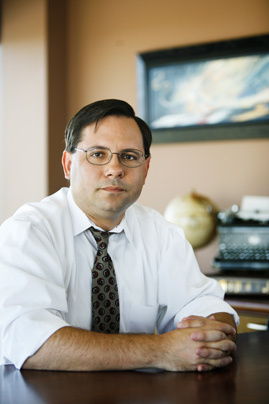 Andy has defended clients in more than 275 federal cases. Andy has extensive experience in opposing union organizing campaigns, union decertification, negotiating labor agreements and arbitrating contract grievances and has advised clients in labor and employment matters in 49 states, Canada, Mexico, Singapore, Japan, Saigon and Puerto Rico. Andy regularly negotiates an average of 12 collective bargaining agreements per year, advises clients on labor relations issues on a day-to-day basis and arbitrates several cases each year. Andy has acted as nationwide counsel for labor and employment matters for a number of companies and represents many regional and national employers, including full service hospitals, extended care facilities, dairies, mines, power plants, marketing concerns, retailers, builders, construction companies, logistics providers, municipalities, law enforcement and not-for-profits. Andy has also counseled many clients on the complicated issues relating to pension withdrawal liability and the Central States Pension Fund, and is a frequent speaker on both topics. In his prior life, Andy worked on an automobile assembly line and within the human resources department for a Big Three automaker. Andy trains clients and their managers on such topics as human resources practice, affirmative action, union negotiating and avoidance, discipline and discharge, the Americans with Disabilities Act, the Occupational Safety and Health Act, Workers’ Compensation and topics involving wrongful discharge. The Labor Relations Institute repeatedly named Andy one of the Top 100 Labor Attorneys in America. The award is based on an objective evaluation of case results, and places Andy in the top 1% of all labor attorneys nationwide. Andy was named one of The Best Lawyers in America in the specialty of Labor and Employment Law, and he has received the highest possible rating (“AV – Preeminent”) from Martindale-Hubbell.